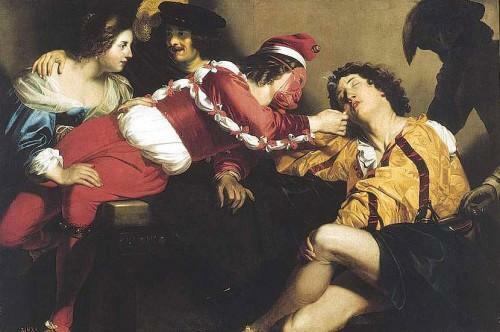 It has been a delight to host the March edition of the Art History Blog Carnival. To mix things up a bit, I thought I also might provide a bit of an introduction for each blog, as this is a nice way to learn about the great range of blogs out there and the amazing people behind them. Baroque Potion is written by David Byron. His rich academic history shines through each post, presenting complex and interesting viewpoints on aspects of art historical inquiry. 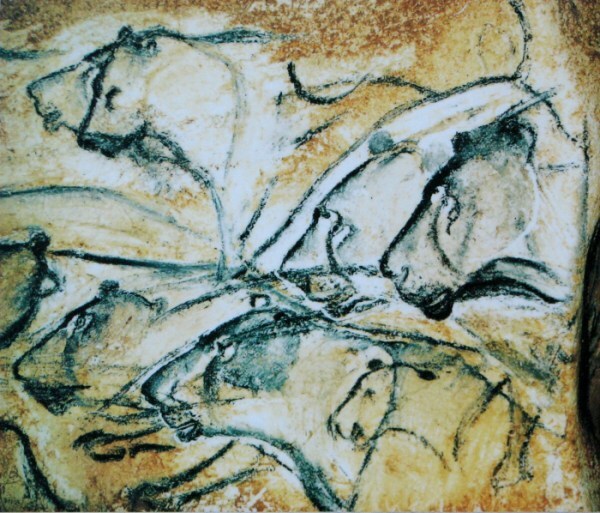 The post submitted for the March Carnival is Prehistoric Painting - a remarkable look at the paradoxical nature of art history being applied to the figures and forms seen in cave painting. 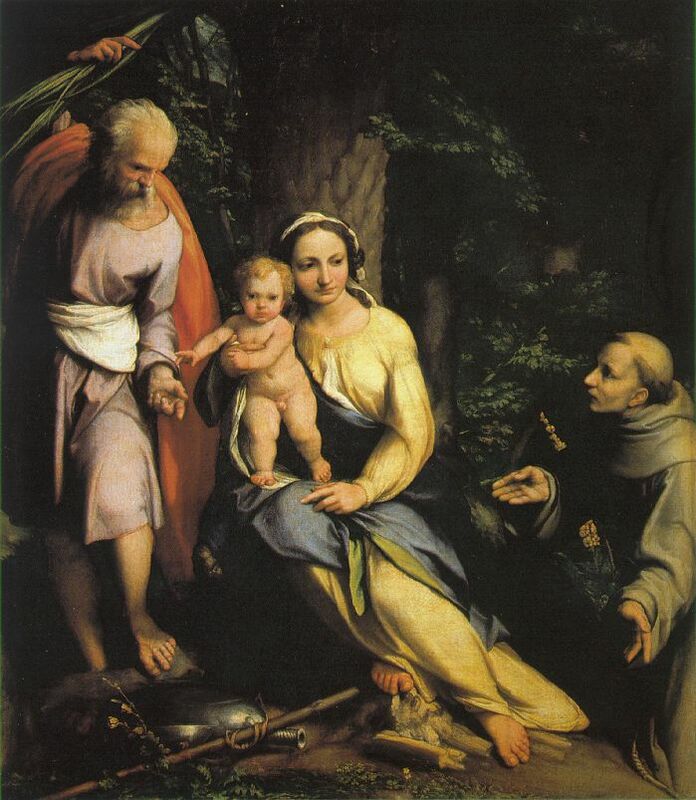 Giorgione et al was created by Dr. Frank DeStefano to provide an online record of his work on Giorgione's famous Tempest - which Frank identifies as an interpretation of The Rest during the Flight into Egypt. As Frank's exposure to the world of online publishing has developed, he has used his blog to explore interesting aspects of works related to Giorgione, his patrons and other artists' depiction of similar themes. The post Giorgione and Coreggio is an absolute must for fans of Renaissance art - exploring Coreggio's depiction of The Rest, which includes an historically out of place St. Francis. 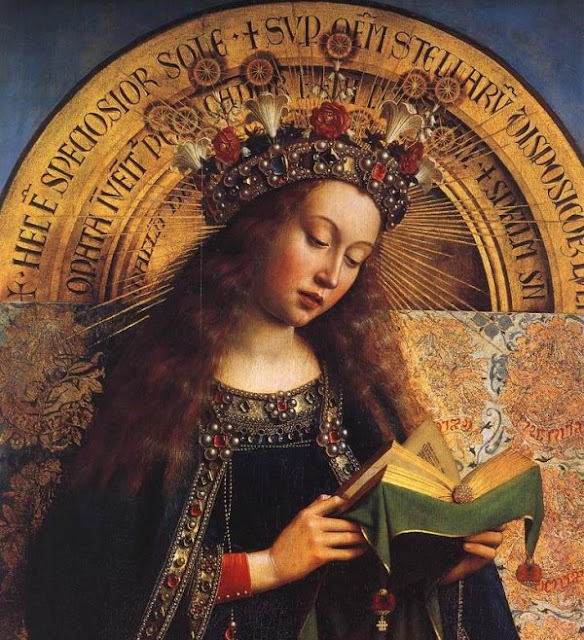 An interesting observation made by insightful commenter Monica Bowen from Alberti's Window about the colours used to depict the Virgin's attire is congruous with the description of 'the woman clothed with the sun' hearkening to the Medieval tradition of depicting The Immaculate Conception/Annunciation with a ray of sunlight. Zsombor Jékeley's Medieval Hungary is a site dedicated to exploring Medieval art history, with a particular focus on Hungary. Posts are replete with fascinating historical detail pertaining to Medieval art, architecture and beyond. The post Hungarian Azurite explores the art historical context of Azurite - a material used by artists to provide a rich, darker blue for their works - with the most well-known example of this being the pigment used in the Virgin Mary's cloak in Hubert and Jan van Eyck's Ghent Altarpiece. The Alchemist's Pillow is authored by Lorenzo and is a compelling example of the richness of content a passionate and knowledgeable writer can provide in an online medium. Looking at the interplay of art, literature and music, Lorenzo's posts are thoroughly researched, thought provoking pieces. In a two-post series entitled Rilke on Rodin, Lorenzo discusses the accounts of German poet Rainer Maria Rilke of French Sculptor Auguste Rodin, and the influence of the sculptor's work on the young poet. Second in the list of enlightening discoveries is Mary Jo Gibson's This Write Life. In a blog spanning art, history and other curious miscellany, this particular submission struck a chord - as it gave me a deeper understanding of an oft ignored Renaissance sculptor - Giovanni Rustici - whom recently has enjoyed a renewed popularity following the Bargello Exhibition featuring his works. 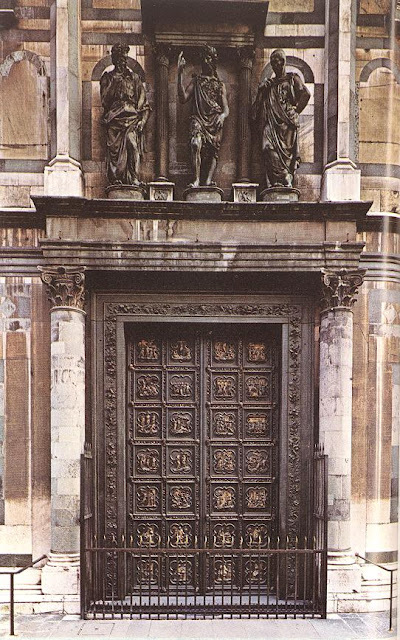 Of his more well known pieces are the three saints adorning the door of the Florence Baptistery, above Ghiberti's Quatrefoil doors. To learn more, visit This Write Life and learn why Rustici's critics used the words "You bloated bladder of arrogance!" Readers of 3PP will know I am a great fan of Monica Bowen's Alberti's Window. What is most inspiring about Monica's work is her tireless inquisitiveness! Monica can take any topic and present it in a manner that gives new insights, encouraging readers to look for themselves and make a personal judgement armed with the facts she presents. Her piece Renaissance art and conception is a fascinating mix of art and history, and its repercussions on the depiction of women and pregnancy in the art and literature of the Renaissance, with a particular focus on a work by Lavinia Fontana, Holy Family with Saints Margaret and Francis. *Martha Lattie of Your Daily Art presents Also Charming, introducing the fascinating story and work of Maud Lewis, the Canadian Folk Artist who painted almost every free surface of her small home. *Susan Benford of Famous Paintings Reviewed presents the curious tale of John Singleton Copley, painter of the famous portrait of Paul Revere as Silversmith. 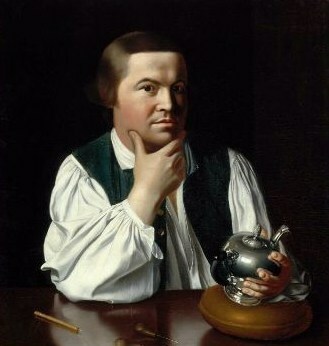 It is amazing to note the juxtaposition between Copley's personal opinion of the Revolutionaries - placed alongside the fact that he is best remembered as the portraitist of one of its most famous characters. A special mention must be made of the ongoing amazing work of Tasha, art historian and bibliophile - and author of Truth, Beauty, Freedom and Books. 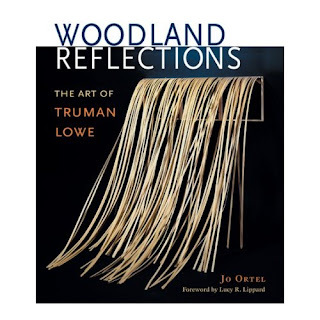 Finding great reviews of art historical publications outside of paid journals is a rare commodity. Reading her review of Jo Ortel's Woodland Reflections: The Art of Truman Lowe was a special treat, providing unique insights and provoking interesting discussion. Keep up the great work Tasha! Great job! Lots of interesting submissions. Thank you for hosting. I appreciate your multifaceted approach to presenting these links, HN! Thanks for listing Medieval Hungary, H! You might like my latest post on new websites - such as AHDB. And hello, David Byron, above there! Many thanks for including me in this month's Carnival. As usual, you did a great job. I loved the images. Cheers for the submissions & lovely comments. @Martha/David - I thought I would approach it slightly differently, in keeping with my usual mode of presentation here at 3PP. @Zsombor Jekely - thanks for the AHDB mention. I'll be sure to add those other sites to the listings as well. It's interesting to note online art history resources are getting more coverage - I noticed a mention on Jonathan Jones blog at the Guardian. This is largely due to the high visibility impact of the Google Art Project, but it's still good to see online art history resources finally get noticed by mainstream media! @Frank - I'm pleased you liked the visual format of the presentation. You know I'm a great fan of letting the images speak as much as the words - hence the reason why I always source a decent quality pic where possible. Thanks so much for your kind words about the blog. I look forward to visiting all the sites included on this month's carnival and getting to know the blogs and bloggers behind them. The thoughtful introductions you write to each are much appreciated. Thank you for including me in such distinguished company! I truly enjoyed reading the other blogs and the many topics covered. It is wonderful to find other sources of research, each with its own unique voice. I love that you included little introductions for each blog and post. Plus, I you included such gorgeous images for this issue of the carnival. Fantastic work! The post on Rustici from This Write Life looks especially interesting! I don't know much about him. I'm excited to read that post (and all of the other highlighted posts). Thanks for including one of my pieces as well. @Lorenzo - I'm pleased yourself and others have enjoyed the introductions. I really wanted to make sure to try highlight some sites readers of the carnival and 3PP may note have encountered before. @this write life - I was delighted to read your submission. I saw Rustici's pieces at the Bargello - they are amazing - especially the Anghiari inspired works. One can only imagine how his career would have panned out had he been a bit better at getting on with patrons! @M - your piece on the depiction of women and pregnancy in Renaissance art and literature was a rare gem - a topic not often covered anywhere. Great job - lots and lots of links and articles to keep me reading late into the night.